Poor man gets pummeled for reporting an undercover officer, in the process of assaulting a young woman in Florida. 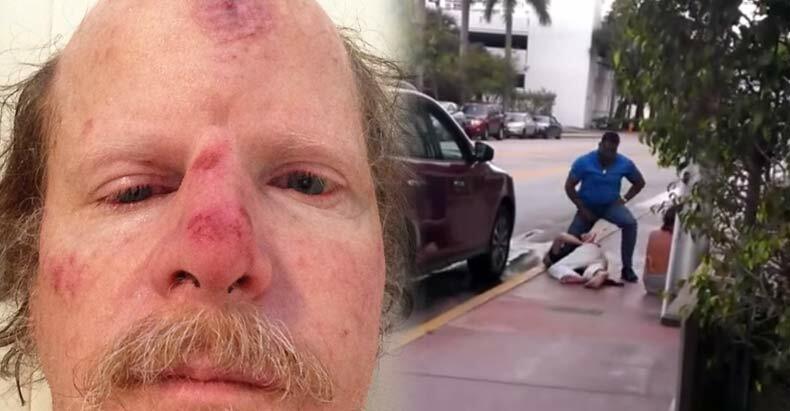 Miami, FL — When Andrew Mossberg witnessed a large man assaulting a young woman in South Beach, he never thought that calling the police would get him beaten and arrested. However, Mossberg didn’t know that the man conducting the assault was a Miami Beach cop. Det. Philippe Archer was working an undercover narcotics operation on June 26, 2013 when he responded to a call about 29-year-old Megan Adamescu, who was allegedly drunk and passed out in the lobby of the South Bay Club. As Archer tried to remove the young woman from the lobby, their altercation spilled out into the street. Mossberg was on his way back to his condo when he came upon this dramatic scene. Mossberg described seeing a muscular man grappling with a woman, punching her and grabbing things from her purse. Naturally he called the police. Once he confirmed police were on the way, he let Archer know. So, it’s not bad enough he was unnecessarily abusing this young woman in the middle of the street, he flew into a violent fit of rage against an innocent bystander just trying to help. According to the New Times, Adamescu was arrested for felony battery on a law enforcement officer, resisting an officer with violence, and disorderly conduct. Archer also charged Mossberg with obstructing justice. In arrest reports, Archer claims Mossberg and Adamescu attacked him despite his telling them he was a cop and showing his badge. These charges would all be dropped two months later. Archer was initially suspended but then was immediately reinstated. But for nearly two years, Archer would go unpunished for his assault on this Good Samaritan. Friday, Internal Affairs finally handed down his official “punishment” for his brutality. For actions that would have landed the average citizen in jail, or at the very least fired, Archer will only be suspended for 160 hours. Just goes to show that no good deed goes unpunished especially if you’re dealing with the cops and no bad deed ever gets punished, especially if the perpetrator is a cop. Previous Gaza? No. Kobani – Syria, after the US finished with it. Next German town abolishes traffic lights and codes – accidents now almost non-existent!